Most of the harbourside bays of Sydney’s eastern suburbs contained Aboriginal settlements at different periods throughout the 19th century. Bayside reclamation works since that time have removed or covered over many of the physical traces of this occupation, but historical documents confirm Aboriginal people had a presence there. Rushcutters Bay was most likely used by Aboriginal people from the early 19th century, but it is from the 1850s that records have survived. 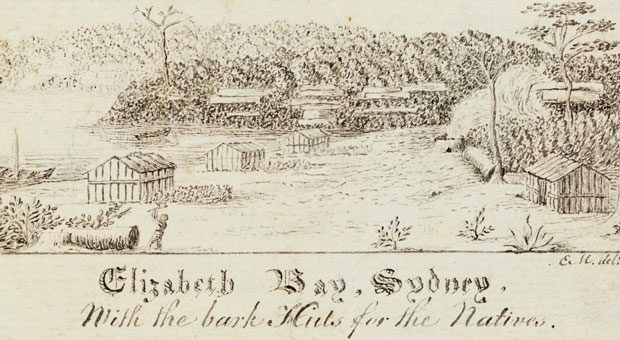 There appear to have been several different Aboriginal settlements at different times, on either side of a small creek winding through the mudflats of what is now Rushcutters Bay Park, and on the higher ground at Edgecliff. Most of the Aboriginal residents of the Rushcutters Bay settlement were connected to Sydney. They included Jack Harris (1810s-1863), who engaged regularly with Europeans in town, and was renowned for emphatically retorting ‘this is my country’ when anyone annoyed him. 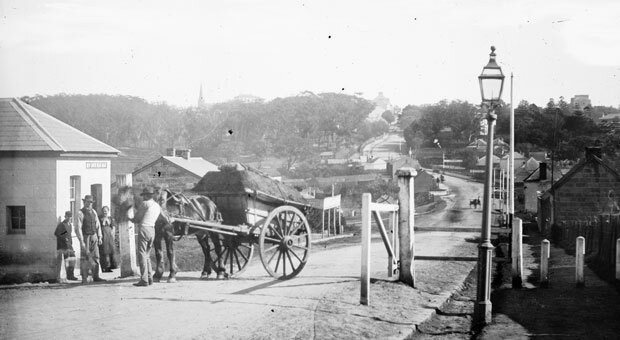 The best documented settlements were those in the bush, close to the South Head Road tollbar (around the corner of today’s Neild Avenue and William Street). The population ranged from a few people to two dozen residents there at different times. Local European residents later described ceremonies taking place there until at least the 1870s, and men spearfishing in the bay. Aboriginal women bailed up the carriages of rich passersby by standing in front of them, in order to ask for money or gifts for their children, just as William Warrell had extracted a kind of ‘toll’ from travellers further down the road. 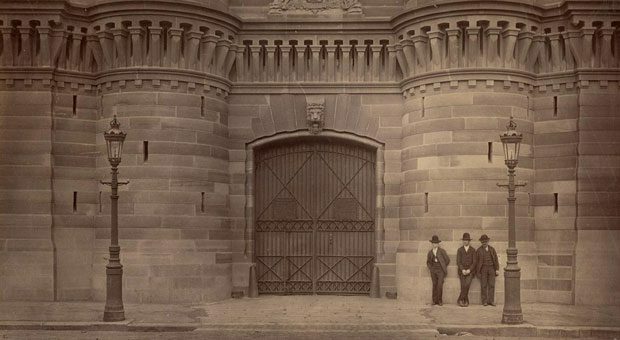 In the 1890s, the settlement at Rushcutters Bay consisted of several gunyahs made of slabs of wood leaning against a fence and covered with iron, sheets and other materials, around a central campfire. By this time the settlement had a few permanent residents who survived by fishing and shellfishing, and by selling boomerangs and shell ornaments in the city. 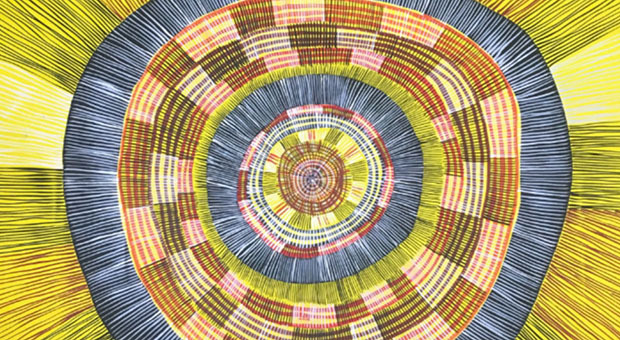 They were often visited by Aboriginal people from other areas who ‘brought birds and honey with them, and exchanged them for fish.’ At one time in 1895, there were several dozen Aboriginal people from La Perouse, Vaucluse, the Shoalhaven district and the mid-north coast living there. This group attracted complaints from European residents, but the authorities had little power at this time to move Aboriginal people permanently away, and Aboriginal people continued to live there until the end of the 19th century. The owners of the neighbouring Mona Estate at Darling Point allowed Aboriginal people to camp in the ruins of an old chapel on the property. The family’s governess, Harriet Baker, was involved in the evangelical Christian Endeavour movement, which was by then active at the Aboriginal settlement at La Perouse. 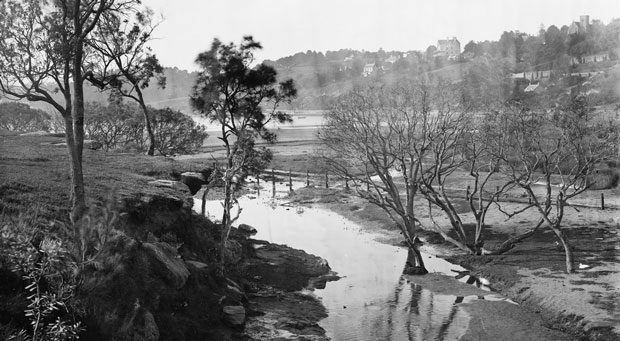 It seems that Baker, perhaps with the assistance of Aboriginal people at La Perouse, persuaded the last of the Rushcutters Bay residents to move to La Perouse in around 1900, and there are no further references to the settlement after this time.